Last year was my first on P4 - stuck mostly to vertical jigging. Couple of the other presentations used there admittedly were a bit intimidating to me so I'm looking for some pointers. Draggin in particular - from reading past posts sounds like a half mile/hr speed upstream and just faster than the current downstream are good guidelines? I can handle that but the idea of keeping you jig off bottom but not too far off bottom seems tricky to me. Pitchin - what would a normal retrieve consist of with a jig/minnow, a jig/ringworm, and a blade bait? Hope I'm not beating that poor horse anymore with this post, and thanks to all who have shared info in the past. Anyone be interested in a midday gettogether for FMers at Dean's in late March or April? Nothing fancy, just say hello, meet some new people, and [PoorWordUsage]. ....or should I say meet new people and chew the fat! aka Everts, believe the closest landing to the [PoorWordUsage] - can get bait, beer, advice, etc. Cooter - just give me shout and I'll walk you through it. I'll be on P4 this Sat but then gone until March. Dragging - takes a while to get the feel but the jig should make bottom contact once in awhile. If I drop my rod back about 3ft and get slack I'm OK. Some days it pays to be higher up like a foot or two. I usually drag two rods from the front - one high one on the bottom until I get a read on the bite. Going upstream is a lot easier when trying to learn the technique so you might want to vertical jig back down stream until you get the hang of it. Jig weight is a big factor. Start with 1/8 going up, 1/16 going down but be ready to move up a 1/16. Jason Halfen has a great article on this. Do a web search on his name. I use braid 10lb most of the time. Pitching jigs I stick with plastics. Cast the jig out, let it settle then lift rod tip. Let jig drift back to bottom on tight line and lift immediately when line goes slack. About a 1ft lift should do it. Reel in any slack just before you lift rod tip. Watch your line for any movement. The real trick is in matching jig weight to current conditions. You don't want too rapid of a fall but you need to "feel" bottom on the drop and not let the current blow the jig out. Here I usually start with 1/8 or 3/16oz jig weights. Pitching blades same idea. You should just feel the blade vibrate slightly on the lift no reason to go over board. Very import to keep line tight and watch it as the strike most often comes on the drop. I seldom go past 1/4oz blades as you are generally not pitching into high current areas with this technique. I prefer to use braid with blades, mono when pitching jigs. Hey cooter, sounds great to have a get together! I'm always up for meeting new people and kicking back a cold one or two. I've learned alot from this site, and im really greateful for that, so I figured I'd register to share some of my great times on pool4, i've fished it for about five years now, and have had great times and hard times, wich makes it all the more fun to hunt down the sacred "eye"
Draggin in particular - I can handle that but the idea of keeping you jig off bottom but not too far off bottom seems tricky to me. Just think of your jighead as the weight in a three way rig. It does sound tough, but it is an easy presentation actually. It is a good presentation to use with four lines (two anglers) A little tip- I use 8'3" Limit Creek medium lights rods to spread out the lines either in the front or the back, then you rarely tangle with the other anglers, because they are usually running 6'6" rods. This length difference really helps. Give it a try in an area you have already caught fish in. It is a slow approach upstream so; dragging in areas that have already produced is a fast way to get more comfortable with the presentation. You also get bigger fish dragging on average versus vertical jigging. Sounds like I may need to start dragging for the larger average. Whats nice is a guy could hit the roller and pick up some small saugers for the pan and a little action and then try dragging for quality. Thanks Turk. Actually do the reverse - those little sauger at the roller bite all day but the dragging bite is best in the mornings and late afternoon - usually. Draggin takes some time to get used to. I am still learning the ins and outs of it. 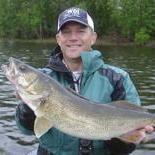 It works all year long on the river and is one of my favorite ways to fish shallow water during summer months. In deep water some guys call draggin "Strolling". I think of strolling as being in deeper water with heavier jigs. Your line is not as far behind the boat ad you have more bottom contact. What truly distinguishes them? I don't know! As far as a big fish tactic I think casting jigs is more productive. Are people draggin paddletails/thumpers more lately in addition to the twister tail plastics? Lots of options, especially if you look at the offerings designed for bass. Side note - I don't know but would guess you're not getting much movement on a ringworm tail draggin downstream? Mike/Mark/Turk - are you using the same plastics when casting/pitching as you are draggin? Pretty much - ringworms, paddletails and Everts ringers. I pitch KGrubs which don't work for me dragging. I have been trying some 5" shad colored swim baits on one of my dragging rods but so far no fish - you'd think it would work. I've started to pitch blades more often than not since Mike has just pummeled me of late with that technique. I actually like to use ringworms and ringers most often for dragging. Some paddletails to though. If you ever seen the bottom of my boat you would see dozens of plastics laying about since I am always trying somthing different. IMO dragging is easiest to learn in about the 10 to 14 foot range, use 1/8 to 1/4 ounce here. When you learn those depths you can drag in deep water. Our own Mike Walerak is very good at dragging in water from 22 to 26 feet. Use 5/16 to 3/8th ounce jigs here.